Most of the central and north California coast is wild, rugged and largely undeveloped, but especially so once beyond San Francisco, as from here to Oregon stretch hundreds of miles of usually deserted, wind-swept beaches, coves and cliffs. Much of the shore is not easily reached due to a combination of steep hills and dense forest, and often those places where the coastal roads (US 101 or Hwy 1) can approach are protected as state beaches, state parks or state reserves. Such is the case for a particularly pretty one mile stretch near the little town of Trinidad, 80 miles south of the Oregon border in the northwest corner of the state. It has clean, greyish sand, rocky promontories, tidepools, short caves, a natural arch and several small islands. Although cold and wet in winter, and often shrouded in mist in summer, a visit any time of year is rewarding - this is a peaceful, beautiful place, enhanced by the unusual rock formations and with the added seasonal bonus of watching whales and sea lions. 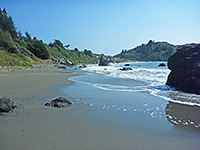 Town and beach are just one mile off the well-travelled US 101, 20 miles north of Eureka. Trinidad is a historic settlement - supposedly the oldest town on the northern California coast - that has been busy since the 1850s, initially as a supply base for gold mining and redwood timber operations inland, and today the facilities include various small stores, guest houses, an RV park and boat rental shops - the region is also well-known for its good fishing. A signposted side road to the state beach ends at a grassy parking area from which several paths descend the bushy cliffs to the sea shore. 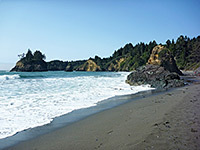 To the left, a sandy beach extends to the high cliffs of Trinidad Head, a steep-sided peak (almost an island) just west of the town center, while opposite are several small rock outcrops, reachable at low tide, and which are covered in an invasive type of succulent flowering plant known as sea fig. 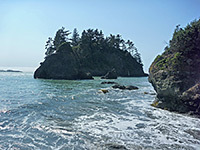 A little further out in the ocean is a rather larger tree-covered rock (Pewetole Island), left standing after the coastline eroded inland. 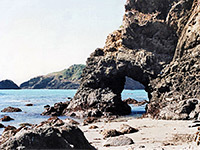 To the right, the beach ends at a small peninsula with a wave-cut arch; beyond this is another long sandy bay (College Cove), which is accessible at beach level only at low tide. Alternative access to the main beach is from another parking area at the foot of Trinidad Head, at the end of Lighthouse Road. The beach margins are home to a good selection of flowers, concentrated around several seeps, and the end of the small drainage of Mill Creek. There is one trail in the vicinity, a 1.3 mile loop around Trinidad Head, the isolated, 358-foot high rock which can be seen all across town. Start point is the parking area on the south side of the state beach, from where a little connecting path climbs to a road leading to the coastal monitoring station built on the summit of the rock; the hike continues along this road a short distance until the trail forks off, cutting through dense vegetation with frequent views of the ocean. This place is usually very windy, and many of the trees are shaped accordingly. Numerous wildflowers grow in the open corridor alongside the path. Several short spurs lead to overlooks, and while there is no single best viewpoint, all of the route is pleasingly scenic. The latter part of the loop gives good views to the south and east, across Trinidad Pier, the smaller peak of Little Head, and Trinidad Bay. The trail meets the road once more, close to the summit, and the hike is completed by walking down, past a side road to Trinidad Head Lighthouse, then back to the parking lot.